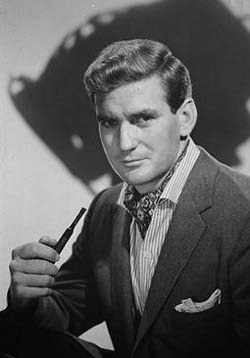 Rodney Sturt “Rod” Taylor was born on January 11, 1930 in a suburb of Sydney, Australia. He was the only child of a construction worker (William Sturt Taylor) and commercial artist and writer of children’s books Mona Taylor (née Thompson). Taylor trained as a commercial artist, but got the acting bug after seeing Laurence Olivier on the stage in Australia while he was on tour. The actor came to America to pursue his career and was signed to a long-term contract with M-G-M. During this period he had supporting roles in A Catered Affair, Raintree County, and Giant (sometimes billed as Rodney Taylor). His big break came when he was cast in the George Pal production of H.G. Wells’s classic The Time Machine (1960). Another great part came his way in 1963 when director Alfred Hitchcock cast Taylor as Mitch Brenner in the thriller The Birds (1963), costarring Hitchcock discovery ‘Tipi’ Hedren, Suzanne Pleshette, and Jessica Tandy. Other starring roles would come Taylor’s way including Sunday in New York (1963), costarring Jane Fonda and Cliff Robertson, the all-star The V.I.P.s, and the John Ford production of Young Cassidy (1965), costarring Julie Christie and Maggie Smith. In the late 1960s, Taylor costarred with Doris Day in two popular film comedies: Do Not Disturb (1965) and The Glass Bottom Boat (1966). He was top-billed in the all-star production of the Arthur Hailey bestseller Hotel (1967). In the 1970s, Taylor had roles in television, including the lead in Bearcats! From 1988 to 1990 Taylor had a recurring role on Falcon Crest starring Jane Wyman. Taylor’s last major film role was a cameo as Winston Churchill in Quentin Tarantino’s Inglorious Basterds (2009). Taylor would have celebrated his 85th birthday on Sunday January 11.